As February comes to a close, so does this month’s focus on tiled hearths and fireplaces. Today I will share three tips that can help you achieve the best design for your tiled fireplace. Tile will dramatically alter the look of a fireplace and improve a room’s look and character for a modest cost. Most fireplaces need just a few tiles, so it’s one place you can splurge, get something you really love, and still not break the budget. 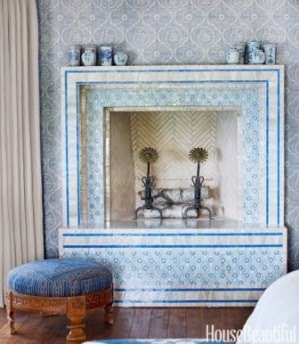 Design Rule #1 for Tiled Fireplaces: What’s your style? Fireplaces that use only plain or field tile. Fireplaces that use pattern tiles and field tile or some other material, like a stone mantle. You can add decorative tile as accents or create a pattern with plain tile using two or three different colors of tile. Decide what style suits your tastes and the style of your house. Choose patterns consistent with your style and textures that will enhance it. The rough, uneven surface of our handmade Rustic Pavers and Arabesque tiles, for example, impart a provincial feel that works great for houses with a Spanish, Southwest or colonial design. Our hand-painted Yucatan field tile will evoke an Arts & Crafts feel when the right glaze color is used. For a more formal effect, look for tiles with a smooth surface and precise edges. Use lighter glazed tiles to brighten the area. Relief tiles are a great way to add texture. Decide on a color scheme and then start looking for tiles! Make sure to give the design aspects of the project proper attention. Take into account the scale, pattern, and texture of the tile. It may sound obvious, simple or overstated, but make sure your fireplace tile design works by framing the fire box. It’s pretty simple, the theme for our design is really about the fireplace – drawing attention, warmth and comfort to that one space to share with friends and family. You can frame the fire box with a decorative border tile or patterned cement tiles. For plain tile installations, use molding, different color tile, or a different format. For instance, if you are tiling the fireplace in 6”x6” tiles, try using a 3”x3” tiles around the box. Sangria red plain tiles frame the fire box. Take a look at the four design ideas below. Notice each one of them frames the firebox even if other design elements like a tiled mural or panel are used. In Design #1, a border pattern of cement tile creates the frame. In Design #2, a decorative liner or border tile frames the fire box. 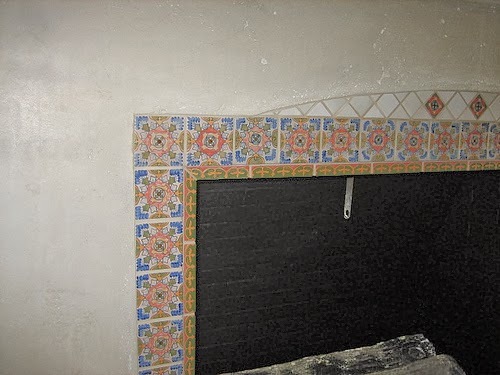 Decorative Andalucia Spanish ceramic tiles create a border around the fireplace's firebox. Similarly, a 6" deco tile was used in Design #3. Plain tiles in sangria red provide the detail for the final design. Scale your project to the size of the room and fireplace surface for balance. Tile size and pattern will drastically alter the fireplace’s appearance. The tile’s size needs to be in scale both to the size of the firebox and the room. The pattern on the tile, the tile layout (or how it is set), color and texture will create an atmosphere – make sure it’s the one you want. A medallion using Celtic ceramic tiles provides subtle interest. Frequently, folks love a certain tile pattern and want to use it for their fireplace. After ordering samples, they will give me a call and say it just didn't work. I’ll often ask, “Did you try it in a smaller format? That fireplace isn’t very big when you are trying to fit patterned and field tile.” Sure enough, the design works when the tile is the right scale for the fireplace. When working with patterned or decorative tile, it’s a good idea to look at patterns that are available in different scaled formats, like our Malibu, Barcelona, Spanish and Portuguese ceramic tile lines. Cuban Heritage Border Tiles provide warm colors and a charming pattern. If you want to tile your fireplace, keep these three tips in mind and you should be on your way to creating a design that you will love! I hope you enjoy our series of blog posts devoted to tile and fireplace design. Design Ideas for Tiling your Fireplace! 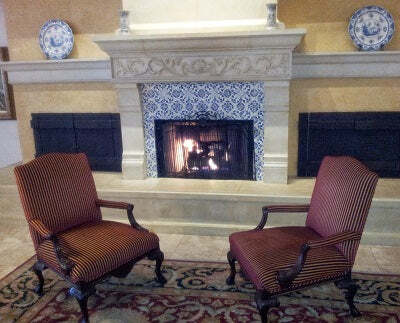 Do you have a question about using tile for your fireplace or hearth? No problem! Leave your tile question in the comments section of this blog, and we'll happily answer any questions you may have. 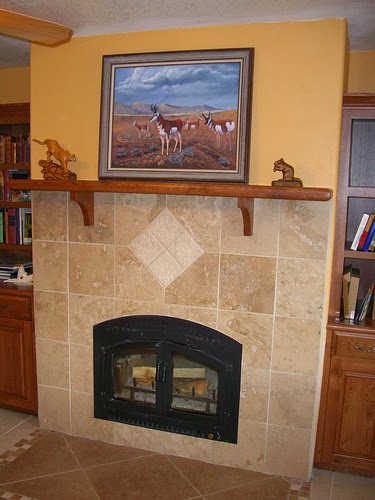 If you enjoyed today's post, then you might enjoy previous posts on tile fireplaces and hearths. An ever-increasing back-to-basics philosophy is leading homeowners towards the path of refreshing and renewing the look of their living areas. Be it a fresh coat of paint, updated flooring, dramatic lighting, and so on, the need for a soothing environment trumps even the most prudent of budgets. Happily, along with this desire for something new and different, fireplaces are also enjoying their place in the renewal process with the limitless decorative possibilities of handmade cement tile, porcelain tile, glass tile, ceramic tile, and mosaic tile. The increased awareness of tile’s long-lasting beauty has not only made kitchen and bathroom backsplashes a showpiece, but the same theory has held true for fireplace hearths and surrounds as well. With a surge in home remodeling projects and newly built homes, homeowners are looking for something different and more personalized to their taste, character and lifestyle. Designers, bloggers, and design-oriented publications have dutifully observed this trend, and have embraced the use of decorative tile fireplaces. Tile offers flexibility to the architect and designer like no other material with its expansive color palette, sustainable properties, and timeless patterns and designs. Let's first look at handcrafted cement tiles, which provide both long life and distinctive beauty. Using a gray-scale color palette, or any other monochromatic color scheme, creates a look that is understated, yet beautiful. Consider a two-tone color scheme (shown below) if you'd like to pair cement tile with natural stone. Although not one piece will stand out over another, all aspects of the space work together to create a cohesive design. The gray and white tones of the Yuna traditional cement tiles frame this fireplace and perfectly coordinate with the marble hearth and mantle. 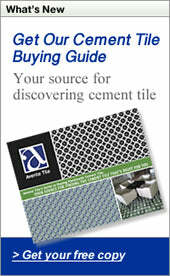 Further, the versatility of cement tile as a building material is not restricted solely to indoor spaces. You can transfer the same rich and silky feeling of cement tile to the outdoors where you and your guests can experience a new environment. Remember, although cement tile can be used outdoors, it cannot be used in frosty environments. If your project is located where frost or freezing temperatures are common, then you should use a porcelain or vitreous tiles for your project. 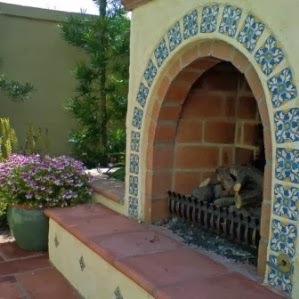 Here are some wonderful examples of indoor/outdoor tile fireplaces. 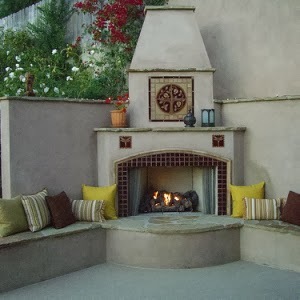 Outdoor living area with a fireplace featuring a ceramic tile Pomegranate mural. 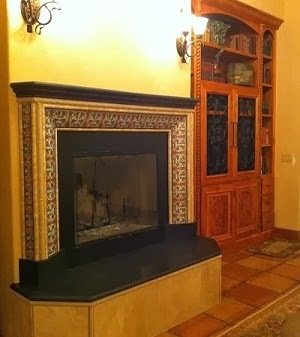 Spanish style fireplace with imported ceramic tiles. Image via Studio H Landscape Architecture. The firebox was built off the floor so the fire could be visible from the bed. Moroccan tile from Urban Archaeology. Image via House Beautiful. 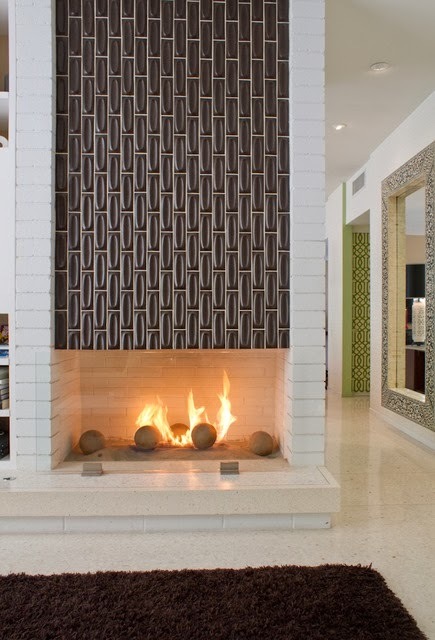 A mid-century modern, two-sided fireplace featuring tile by Heath Ceramics. Hand-painted Albacete Spanish ceramic tiles are right at home with the terracotta floor pavers, stone molding and black granite mantle and bench. Bruce Palmer Interior Design used glass mosaic tiles by Walker Zanger to create a contemporary fireplace. Image via Houzz. Which type of tile would you use for your next indoor or outdoor fireplace or hearth project? Do you prefer to make your fireplace a focal point of the room, or would you rather it blend in? With heart-shaped candy boxes and cuddly teddy bears taking over store shelves, there's no denying that Cupid has his arrow poised to strike lovers this Valentine's Day. But nothing says love like a cozy fireplace with hand-crafted tiles. With cold days and long nights, there is nothing better than warming up to a fire in the hearth with friends. Make your fireplace the focal point of the room with hand-painted ceramic or cement tiles. The bold colors and intricate Cuban cement tiles patterns create a cozy fireplace. 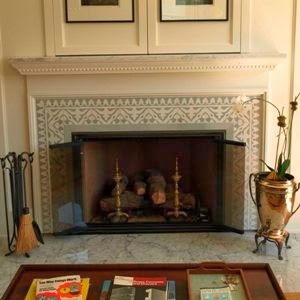 In this case, the border and corner pieces that are normally used to frame a tile rug can be used around the firebox. To avoid cuts and cement tile trim, the cement tile is paired with a plain ceramic tile that compliments the design and helps to simplify the installation. The customer's choice to use our popular Cuban Heritage Design 110 in the rich, warm "C" colorway was smart. The palette provides an intimate location that you will want to cozy up to any time of the year! 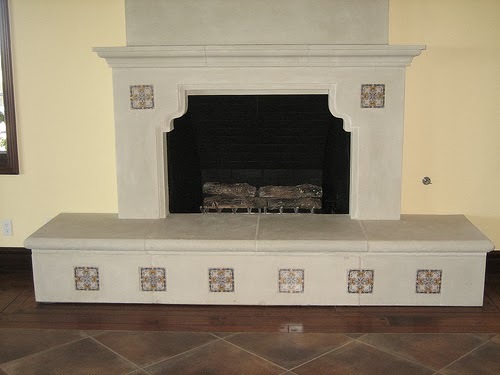 Using cement tile for a fireplace is a fantastic way to add visual appeal to your space. Available in multiple patterns and a broad color palette, cement tiles help create a dramatic focal point that become the theme of the room. However, decorative ceramic tiles, like our Malibu or Portuguese tiles provide eye-catching patterns and designs. 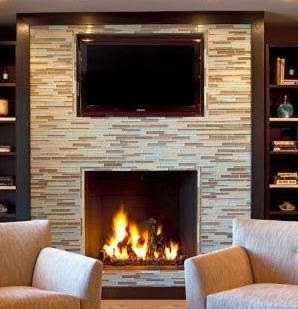 Also, our ceramic mosaic tile designs are perfect for adding the right touch to a fireplace, hearth, mantle or chimney. And, don't forget the stunning glazes found in our hand-painted plain or field tile can provide an elegant and classic look, too. A fine-looking fireplace fills your home with warmth and beauty, as well as creating a social center for friends and family. Here are a few different design ideas to get you thinking about finding a design and look that speaks to you! More Design Ideas for Tiling your Fireplace! Do you have a question about using tile for your fireplace? No problem! Leave your tile question in the comments on this blog and we'll happily answer any questions you may have. Winter is in full swing for many parts of our country! Our Pinboard selections for this month reflect both the seasonal changes and the area in our homes that will garner the most use and attention – the fireplace! There’s no doubt that the attractiveness of a crackling, yet soothing fireplace will mesmerize even the heartiest of humans and creatures alike. With bone-chilling winds, rain and snow, you can keep the warmth and coziness a fireplace emotes year-round with our ceramic tiles or with our extensive collections of handmade cement tiles. Check out how our Classic Cluny Cement Tile was used in this Fireplace Surround design, and the starring role our Traditional Yuna Cement Tile played on this Monochromatic Cement Tile Fireplace. For our friends who enjoy winter in a milder, Mediterranean climate, consider a ceramic tile mural for your outdoor fireplace, such as our Pomegranate Mural, for example. Inspired? Then visit our pages on houzz.com, our boards on Pinterest, and browse through dozens of our Cement Tile Design Ideas portfolio page where you can find a large collection of projects showcasing our handmade and hand-painted ceramic tile, cement tile, decorative tile, mosaic tile, and so much more. Let us know how we at Avente Tile can assist you! Trim and molding seems to be one of the most confusing details in a tile installation. It's easy to understand why there is so much confusion. First, there are no industry standards and this results in numerous colloquial terms used to identify the same type of finished edge. For instance, the terms "surface bullnose" and "single bullnose" refer to the same transition on a finished edge. The terms molding, moulding, trim and base trim all describe the same basic finishing material. Additionally, there are a myriad of slightly different designs of the same trim that all perform the same function. For instance, Heritage Skirting is a base trim molding with decorative ridges. Finally, many of these pieces are infrequently or rarely used, if at all. So, let's discuss and understand the most common (and useful) transition: the bullnose. This blog post is devoted to cement tile bullnose trim. If you are working with ceramic tile, you might want to read an earlier post that I devoted just to that topic, How to Finish an Edge of Tile on a Wall. I often get the question, "Why use bullnose to describe a radius edge on tile?" The term bullnose originates from the rounded nose of a bull or cow. Bullnose is a common term used in building construction for trim tile with rounded convex edges. The term is particularly common in tile and masonry architectural terms. It's important to note that bullnose tile provides a finished surface. You'll see the pigmented cement color and not the unsightly edge that shows the color layer and grey concrete with aggregate. More than likely, you've seen single bullnose and double bullnose tile in an installation similar to the one shown in the photo below. Even though you may not be able to recognize them yet, there is a single and double bullnose tile used on the base trim in this installation, creating a professional, finished look. Remember, bullnose is a term to describe tile with a rounded, convex edge that provides a finished transition to another surface. You might also hear phrases like "rounded edge" or "radius edge" or "fillet" to describe bullnose tiles. This finished, rounded edge provides a transition from the tile surface to another surface, like a painted wall. A tile that has one finished edge is called a Single Bullnose (SBN) or Surface Bullnose (SBN). A tile with two rounded edges is a Double Bullnose (DBN). If the two bullnosed edges are adjacent, they'll be on the corner of a tile and called a Corner Bullnose. Corner bullnose is a special type of Double Bullnose because the two corner edges have a finished transition or smooth, rounded corner (or fillet) edge to the surface. Now, let's take a closer look at this installation and identify the single and double bullnose trim pieces on the 3" base molding. Here's another view of the same installation that allows you to see the top, finished edge of the tile. Heritage Double Bullnose (DBN) molding must be specified as as "Right Hand" or "Left Hand." Make sure you understand the difference and order the correct quantity of each. It's not hard, but it's an important detail that if not attended to will only add frustration and delay to your project. Right Hand Corner bullnose will have a rounded corner on the right hand side of the tile when you are looking at it. Left Hand Corner bullnose will have a rounded corner on the left hand side of the tile when you are looking at it. Remember that there is no specific standard for right and left hand bullnose pieces. Order the wrong ones or make an assumption and you'll likely end up with a white elephant. Make sure to understand each vendor's nomenclature to get the right material the first time. Additionally, molding and trim is usually made to order, so not only will you end up with something you can't use, it could definitely delay your project.